Robert C. Wolcott, Contributor – I explore business, leadership and humanity in our technological age. 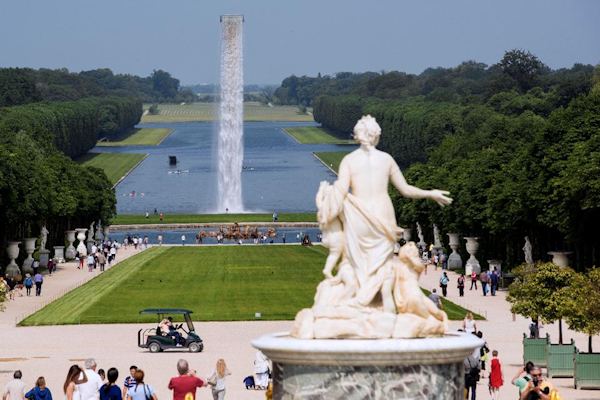 Louis XIV of France, the quintessential absolute monarch, demanded that the extensive water features of his beloved Versailles palace grounds remain constantly in operation. His minister of finance, Jean Baptiste Colbert, recognized this would be financially ruinous. To satisfy the king’s demand, the Versailles staff constantly tracked his whereabouts, ensuring that all of the fountains he could see would be in operation, leaving the rest dormant but ready. Louis’s agents were creating a ‘virtual’ reality responsive to his desires. As far as the Sun King knew, his fountains were always on. Technology later this century will enable each of us to command our realities in a similar fashion— or for others to create our realities on our behalf. Many people perceive virtual reality (VR) as a sort of video game: an environment constructed by programmers in which the user is simply a participant. As VR matures, users will become increasingly engaged in co-creation. Platforms like Minecraft already offer this, where users create their own virtual worlds and interact with others within them. The experience will become far more comprehensive and customized. Later this century, virtual environments may become experienced comprehensively as new versions of reality, as we have explored in past articles in Forbes and HuffPost. The only way you will know they are virtual (i.e. not the “default world”) is that you will know they are so, similar to how dreams feel real while dreamt. As computational systems become more capable of deciphering and anticipating human preferences, such systems could generate customized environments in real-time with less conscious input from users. Eventually such systems may not require conscious input to capture and respond to shifting user preferences, though user intervention might still remain an option. The notion of ‘virtual’ fails to accurately describe such a world. Even the terms ‘augmented reality’ and ‘mixed reality’ reflect neither the permutations that may evolve, nor the manners of their construction. We propose a new moniker to describe where we’re heading: synthetic reality. Such systems will synthesize our will and preferences, whether or not consciously provided, into new, ever-evolving realities. VR experiences are always co-created to some extent, between the pre-defined capabilities and rules of the environment and the cognitive boundaries of users. As this process becomes more organic, arising from interactions between human and AI systems, and dynamic, potentially based on the preferences of multiple systems and actors in a given environment, new realities will synthesize, evolve and proliferate. Ones not bounded by our imagination or perception of our current default world’s limitations. Again, dreams offer a good analogy– where our default world’s rules can be bent and our mind accepts such conditions as reality. Antecedents exist. For instance, Amazon practices “anticipatory shipping,” where they send products to distribution centers near specific customers before they have ordered. By monitoring the online behavior of individual customers, Amazon anticipates what they will likely order. Any company applying data analytics to understand specific customer preferences illustrates this trend. With such systems, how much easier might Versailles’s fountains have been to manage? Technological overlays to our current “default world” (as the traditional ‘real’ world is known), will combine and morph into worlds of their own. Using an analogy from Quantum Mechanics, while physicists currently refer to the “multiverse” when reflecting on alternative universes of choices not taken, we can now think of ‘multi-realities’ that exist within our current dimension but reflect a variety of experiential options. The term ‘synthetic’ reflects that these environments will be constructed through a variety of inputs, synthesized by combinations of human and artificial intelligence (AI). Virtual reality reflects where we have been. Synthetic reality represents where we are headed. Brave New Worlds— Alone or Together? When human beings have the opportunity or curse of experiencing worlds composed to individual desires, is this a desirable future? Will constant response to our preferences magnify human tendencies to thanklessness and narcissism, extending our hedonistic boundaries toward an ever-unfulfilled void? The present customer-obsessed commercial world validates this risk. For each of us, constructing and selecting between essentially unlimited possible realities intensifies the personal challenge of where to focus attentions. To what extent will we seek to control and eliminate—or enable—uncertainties in these synthesized worlds? Consider how you’d feel in a comprehensive reality at all moments optimized for your preferences, seeking to enhance pleasure and eliminate pain (unless preferred), void of hazards and undesired uncertainties. Might this be your paradise or dystopia, or both? How much will you be willing to divulge of your preferences, intentions and emotional states, and to whom? An essential question will be whether we experience these new realities alone or together. Humans are intensely social; nonetheless, with the advance of AI, a human could exist within synthetic realms devoid of other homo sapiens, with sociability satisfied by AI. Human or non-human-like proxies could manifest as mentors or sycophants, allies or adversaries, intimates or indifferent masses, or all of the above. While a solitary existence in our traditional sense, such synthesized worlds could be rich with social interactions. Alternatively, we could synthesize realities with other human beings, from few to many, and/or with AI systems enabled with ‘wills’ of their own. We already socially construct reality, as articulated by philosophers from Plato and Immanuel Kant to Jürgen Habermas and Richard Rorty. With synthetic reality, we could directly socially construct comprehensive new realities. Within community-defined environments, we forfeit some control while gaining the creative ferment of community, engagement and even conflict. Combining the visions of everyone into one collective dream, manifesting Carl Jung’s notion of collective consciousness. Synthetic realities transcending the sums of their participants. Synthetic worlds will share similarities with default reality—evolving within context, subject to internal rules, defined by interactions between agents (e.g.—human or otherwise)– except with the option to exist within and co-create a potentially unlimited range and diversity of worlds, with or without others of our species. In the late 19th century, French theorist Émile Durkheim, a founder of what became Sociology, reflected on the causes and social perspectives of suicide. He proposed that, “Reality seems valueless by comparison with the dreams of fevered imaginations; reality is therefore abandoned.” As synthetic capabilities advance, our fevered imaginations will emerge as catalysts of new realities. Suicide will no longer be the only definitive way out. But when we can truly go anywhere, where will we go? Perhaps we will discover we are fulfilled only from the belief that we are so?